It’s pretty safe to assume that most adults already had chicken pox in their youth. You might even remember going through it yourself. But did you know that the virus never actually leaves your system, even long after your symptoms have cleared up? And it could cause some big trouble. After your immune system conquers the childhood illness, the virus remains vital but inactive in your body. In some cases, it could be reactivated later on in life and wreak even worse havoc on you than it originally did. If you’re over the age of 50 and have experienced excruciatingly painful and blistering skin rashes, then you already know I’m talking about shingles. Studies have shown that approximately 50% of middle-aged Americans will be affected by the shingles virus—the varicella-zoster virus (VZV)—in their lifetime. This statistic might seem astounding, but it actually makes sense considering most people already contracted the virus when they had chicken pox. The good news is that shingles is a non-life-threatening condition. Also, its symptoms are highly treatable and manageable. The bad news is that it’s an incredibly painful, unsightly, and uncomfortable condition that prevents you from living life normally. And there’s no permanent cure. Unlike chicken pox, once you get shingles, the likelihood of the rash returning is a lot higher. 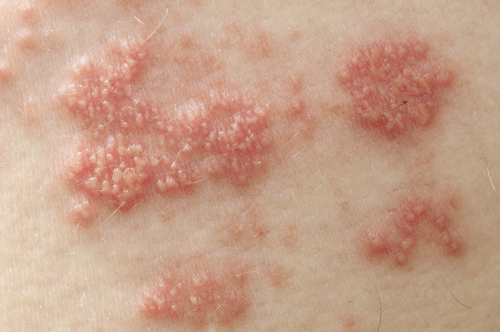 Similar to chicken pox, the shingles rash is highly contagious. You should cover up the rash and clean the area frequently. Avoid contact with others, especially pregnant women and people with weakened immune systems. You’re most likely to develop a shingles rash if you’ve had or currently have cancer, chronic kidney or lung disease, or an autoimmune disorder. Thankfully, there’s a vaccine available that you can take as a preemptive strike. Even if you’ve already had shingles before, the vaccine can help prevent it from coming back. However, the vaccine doesn’t kill the virus; it merely weakens it and slows it down. Your doctor might also prescribe medication to help relieve your pain and assuage some of the inflammation caused by the rash. But is it possible to also use natural remedies to soothe your rash and pain? Yes! 1. Take a cool, cleansing, soothing bath with one to two cups of colloidal oatmeal or cornstarch (or both) for about 15 to 20 minutes. Avoid using hot water because it increases blood flow, which will only exacerbate the inflammation and pain from the rash. Thoroughly dry your body after the bath and always immediately wash your towels and your clothes to prevent spreading the virus to others. 2. Apply soothing lotions and creams. Anything that contains the anti-inflammatory element capsaicin, calamine lotion, or even aloe vera should help calm the pain, irritation, and dry skin. 3. Boost your immune system with a healthy diet full of essential vitamins and nutrients. This is perhaps the best solution of all. Stay away from foods that are high in saturated and trans fats, arginine, and refined carbs, especially anything that has a high sugar content. Vann, M., “15 Most Common Health Concerns for Seniors,” Everyday Health, August 1, 2016; http://www.everydayhealth.com/news/most-common-health-concerns-seniors/, last accessed May 25, 2017. Troy, H., “Why Boomers Should Consider Shingles Vaccine,” Everyday Health, March 5, 2014; http://www.everydayhealth.com/news/why-boomers-should-consider-shingles-vaccine/, last accessed May 25, 2017.